1v1 soccer moves push athletes to handle situations on their own, forcing them to become proficient at strategy and prediction of the opponent’s moves. With the moves provided here, athletes can practice being both an offensive player and a defender. 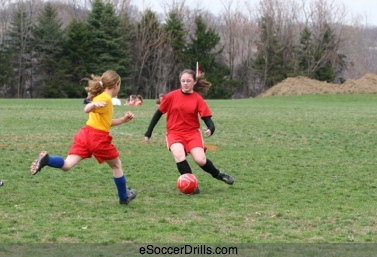 1v1 soccer moves help all athletes become stronger, both offensively and defensively. In this move, players are split into four groups, standing at each of the four corners of a field, 15 feet wide and 15 feet long. The first player from one group passes a ball to the first player of the group diagonal to them. The pass receiver becomes the offensive player and the passer becomes the defensive player. The two play 1v1. The offensive goal is to push the ball back to the defender’s corner. The defender’s goal is to prevent the ball from reaching their corner and even to steal it in order to get it to the other player’s corner. The drill is considered over when the offensive player succeeds or the defender gains control of the ball. During this drill, coaches can focus on several things. Players learn to work both offensively and defensively. Offensive players must learn to be quick enough to get around defenders without giving away their next move. Defenders must learn to anticipate their opponent’s next move and have technically correct footwork in order to foil their plan. Players are split into groups of two. One has the ball as an offensive player and the other is a defender. The offensive player’s goal is to fake the defender into moving in a certain direction, allowing the offensive player to quickly pass the ball through the defender’s legs and dart around the defender to pick the ball back up. To be successful at this move, the offensive player must fake out the defender with head and body movements that lead the defender into thinking that they are planning to move in a certain direction. As soon as the defender believes the offensive player, he or she will also move in that direction. It is then the responsibility of the offensive player to switch directions as quickly as possible and make a quick, tight pass between the defender’s legs. This pass must get the ball through the defender’s legs and out of danger of the defender picking it up, but it cannot be so far away that the offensive player cannot regain control of the ball. Coaches should allow athletes to practice the through the legs pass several times each, giving players the experience of being both the defender and the offensive player. 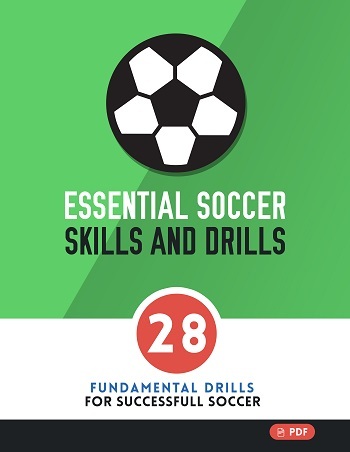 1v1 soccer moves are some of the most difficult, but most useful, moves a player can learn. By teaching athletes how to work 1v1, coaches prepare athletes for difficult situations in competition and give them the skills necessary to out-think and outperform an opponent.